20120220 - Up in the am and the boys an I met the Mallonn's for breakfast. We headed home and got to work. 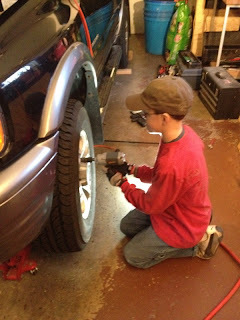 D&I worked all day replacing the brakes and shocks on the black car. In for a bit of food and then I took the boys to Bible Bangers with me. We had a good time but J wasn't feeling great and spent the night on the coach.